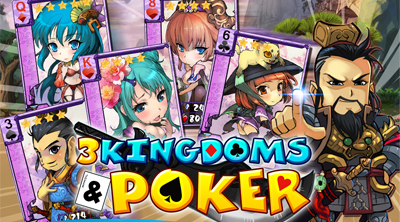 3 Kingdoms and Poker is a card based RPG game presented by Harmony Technology Co., Ltd. Available on Android - Google Play and iOS - App Store. Fight in famous battles using your "Full House" and "Royal Flush" hands to activate skills that will eliminate your enemies. Sit back, Relax, and Play Poker like never before! - You can level up by exploring and completing stages. - Challenge the NPCs (Non Playable Characters) in story mode. - You will receive more exp when battling stages with more stars, be careful though because more stars might require a better team. - You can purchase energy everyday to complete more battles and to level up even faster. How To Get More Cards? - You can draw more cards with silver, gold or FP. - You can get silver or gold shards from card draws, achievements, daily logins, Musou combats, completing story battle, or from special events. - You can get Card shards from the chests dropped in Daily event battles or random Musou combats. - Level 4 and 5 of each story battle has a chance to drop 4* and/or 5* cards. How To Earn Silver Quickly? - Silver is used to level up cards. - You can earn it from trading, exploring stage battles, duel rankings, robbing, shard chest, stage daily rewards, daily login rewards, and daily event battles. - When your energy isn't full, Energy is restored at the rate of 1 Energy per 10 minutes, . - You will also receive 20 bonus energy at 12:00 and 19:00 ("in-game server time"). How To Get More WP? - WP is used to level up AcePack, which will make your team stronger. - You can gain WP by completing achievements, clearing stages, finishing story battles, conquering Musou combats, and occupying Musou gates. - AcePack can increase the cards’ HP and attack every time you deal cards that meet the criteria. -The easiest sets to make are Triplet, Straight, and Bomb. Bomb has the strongest effect among the three. A level 7 Bomb will increase 300 attack and 900 HP for the cards, so focus on a card set base on the AcePack effect is a good way for you if you want to be an expert. - It is important to form a card set containing cards of the same suit at higher level. The bonus HP and attack from buffs such as Blood and Iron can be accumulated to all the cards of the same suit. A card set of the same suit of only 4* cards with Blood and Iron buffs means you have 9 buffs for every card when you have 10 cards in the set, and this is also the easiest way to create a Bomb. - This strategy is the best when you don’t have a full 5* card set yet. - This is the best and easiest set to build for players without high * cards, this strategy is also used greatly during PVP at lower level. - Zu Mao, Dong Zhuo, Yan Liang, He Jin (Used when you don’t have enough Dong Zhuo). This is the best set to fight against players with 4* and 5* cards with long CDs, the best set is 5 x Zu Mao and 5 x Dong Zhuo. You can enhance 3* to 5* cards to Level 10. - [3* to 5* cards at Level 10] + [a card with the exact same name] + [a card with the same *] = New card! - For example: [LV10 Lu Meng] + [LV0 Lu Meng] + [LV0 4* card] = A G. Lu Meng at around LV14! - After enhancing a card, you can boost it to LV15 to increase attack and HP, level up current skill and unlock fourth skill slot. - Learn, replace and level up skill will consume a skill book every time, the success rate varies every skill. - Refine a card can turn the unlocked skill into a skill book (the card will be gone), it has 100% success rate, and you should be able to get multiple skill books from high level skills in theory. - Skill books doesn't have a level. - A card cannot learn skills that are already on that card. 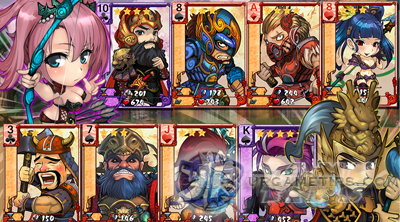 - You can practice how to enhance a card with a 3* card and learn common skills such as Armored. When you are more familiar with the process, enhance 5* cards. - Here is a sample list of skills these bosses have, read it carefully and build a card team that will best stand against these bosses. The reward is given based on the amount of damage you dealt. - Bash: 100% chance to deal 500% damage when attack. - King Kong: Reflect 200% damage to attacker and it's neighbor cards when attacked. - Shield: Ignore all skill damage and effects. - Seal: Deal 8000 damage to 1 enemy & 30% chance to Freeze, ignore Shield. - Edge: Deal 10000 damage to front enemy, ignore Shield. - Goddess Luo: Deal 3000 damage to all enemies & 30% chance to Freeze. - Evade: Deal 5000 damage to attacker when receiving Physical damage. - Point: Deal damage to front enemy and it's neighbor cards. - You can also increase your cards' HP and attack by using Gold or Silver cheer. - Boss event is a PVE event, the cards won’t be buffed from guild tech. If you have discovered an awesome 3 Kingdoms and Poker tip, trick, or strategy, feel free to share them here too by using the comment section below this guide, thanks for helping other players!